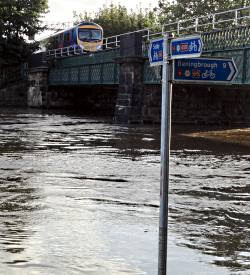 York's great flood - the biggest since 2000 - topped out at 5m above normal on Wednesday last week. 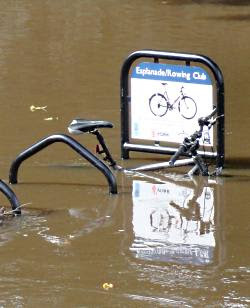 It wasn't the best time to realise you'd left a bike locked to the riverside racks by Lendal Bridge (picture). 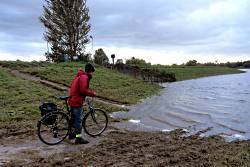 Or to attempt to cycle the riverside path north out of the city (picture) without a wetsuit. But now, over a week on - even though the river has dropped to near normal levels - many surrounding areas are still under water. The low-lying meadows north of the city are huge water tanks, storing up potential flood water until it can be safely flushed down the Ouse. Cycling is, therefore, not always straightforward (picture). York's outskirts are more like the Everglades. Here's the riverside path (picture) just north of Skelton, a couple of miles from the centre, last Thursday. This particular bike ride decided not to go any further; anyway, one of the group said they were allergic to fish. 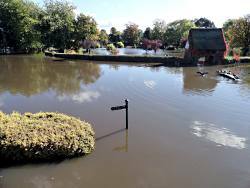 And this (picture) is Rowntree Park this morning, transformed into a giant lake, a little bit of Florida in East Yorkshire. There's No Cycling in the park, though local custom is to ignore it. Nobody was cycling today, though. 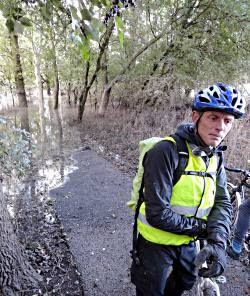 So perhaps York's city centre Pavement Cycling problem will resolve itself soon, thanks to global warming: those low-lying footways will simply be too flooded too often to bother cycling on.